Flowers and variegated leaves at Kaeleku, Maui, Hawaii, USA. June 23, 2009. Origin and Habitat: Garden origin. The natural species comes from South-east Asia. Pleomele angustifolia var. angustior Ridl. Description: Dracaena angustifolia is a rhizomatous, perennial herbaceous plant, forming large climbing shrubs with few ascending branches or small Slender trees with weak pendulous twigs, and 1-3 m tall. The sessile linear leaves are born in dense rosettes, followed by yellow flowers in terminal racemes to spreading panicles and globose compressed 3-lobed berry. It is widely cultivated as a garden and indoor ornamental plant. cv. Honoriae: Dracaena angustifolia 'Honoriae', a.k.a. “Margined Narrow-Leaf Pleomele”, is a lovely cultivars with narrow foliage, with a narrow light golden margin, on snake like stems. Very showy, can be grown in the sun or part shade. 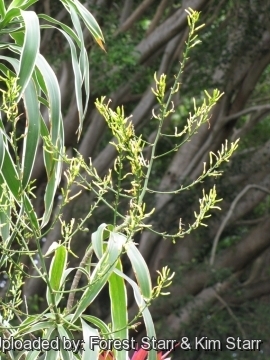 Stems: The stems are simple or few branched, greyish and smooth. Internodes often longer than wide. 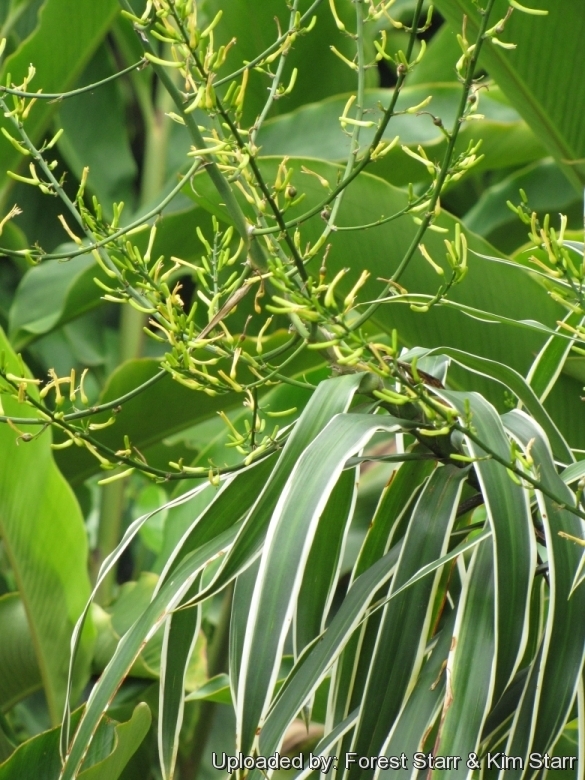 Leaves: Leaves spirally arranged, spaced along distal part of stems, sessile, subsessile or indistinctly petiolate; petiole to 1 cm, base not completely covering internode dark glossy green with a narrow light cream margin. Blade, fleshy, sword-shaped to linear-oblanceolate, (15–)20-45(–50) cm long, (1–)1.5-3.5(-5) cm wide and tappering to a sharp tip. Inflorescence: Terminal, paniculate, usually with only one order of branching, and 30-50 cm long. Rachis glabrous. Pedicels (5)7-8(-10) mm long, articulated above the middle. Flowers: Arranged in clusters of 2 or 3(-4), perianth greenish white, 1.8–2.3 long, tube 7-8 mm in diameter. Lobes of the perianth 6, 10-16 mm long. Filaments filiform, anthers 2-3 mm long. Style 5-8 as long as ovary. Fruits. Orange, globose, 8-12 mm in diameter, flesh thin orange and contain 1-2 seeds. **Seeds: Large (12 mm Ø), translucent cream. Blooming season:*** Flowering March-May, fruiting June August. Dracaena angustifolia cv. Honoriae: has narrow foliage, with a narrow light golden margin, on snake like stems. Dracaena menglaensis G.Z.Ye: has longer, sword-shaped leaves with bases completely covering internodes, perianth lobes tinged reddish purple distally, and 3-ribbed berry with 4 small, apical projections. Distribution: S Yunnan (Mengla Xian). 2) Flora of China Editorial Committee. 1988-2013. "Fl. China Unpaginated." Science Press & Missouri Botanical Garden Press, Beijing & St. Louis. 3) Flora of China Editorial Committee. 2000. "Flora of China" 24: 1–431. Science Press & Missouri Botanical Garden Press, Beijing & St. Louis. 6) Forest & Kim Starr “Dracaena angustifolia (Dracaena)”. Plants of Hawaii. <http://www.starrenvironmental.com>. Web. 13 Jan. 2015. Cultivation and Propagation: Dracaena angustifolia comes under the category of Tropical Shrubs and is perfect for growing indoors. Average water needs, but don't over-water and suitable for growing in Pots. Suitable for both Home and Office, also cultivated as an ornamental shrub for parks and gardens. It will grow in warm subtropical or tropical climates and appears to be easy-to-grow and rewarding. It has average water needs, but don't over-water. Soils: Need very drained soils and is suitable for growing in Pots. Give the plant an airy growing medium consists of both non organic material such us clay, pumice, lava grit, and peat or leaf-mould. It like quite small pots, repott in very later winter, early spring. Fertilizing: Ferilizers can be used in light amounts. Apply general garden fertilizer (10-30-10) including all micro nutrients and trace elements or slow release fertilizer to the planting bed at 3-month intervals during growing season, and to container plants at bimonthly intervals. Exposure: Requires sunny or half-shaded locations. Water Requirements: Water regularly during the active growing season from March to September, but do not overwater this plant. No water should ever be allowed to stand around the roots. Keep almost dry in winter. Hardiness: This plant has tolerated temperatures down to –0ºC. However it can be difficult to get it to look its best without a good amount of heat and sun and so it is only really suited to the tropics (USDA Zones 10-11). Keep the plant cooler in winter, but maintain the light as bright as you can so that any growth which it may produce at this time will not be etiolated. It can be grown outdoors in the summer months to benefit from direct exposure to light, and especially exposure to high summer temperatures. Wind tolerance: Has a limited wind tolerance it is knock over by very strong winds, the plants may smash to to the ground... best to plant in such a location where winds are not a big issue. Pruning: None necessary, except to remove dead lower leaves and spent fruit stems (panicles). Drastic pruning usually not needed. Garden uses: The neat appearance of this shrub ensures it a place in parks and gardens wherever there is a suitable tropical climate. 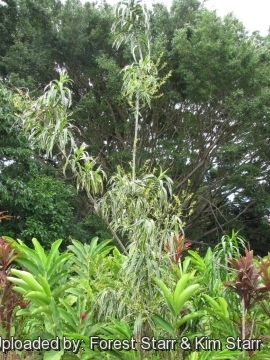 It also cultivated as specimen plant; and large container plant with dramatic sword-like foliage. It makes a good house plants for a Dracaena, though recommend higher light if possible. Propagation: Variegate cultivars are easy to grow from cuttings.